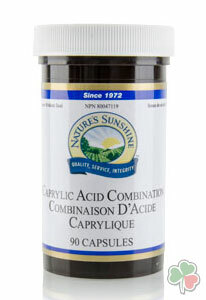 Caprylic Acid is a naturally-occurring fatty acid with the ability to disintegrate yeast cell walls. Thus caprylic acid can help control candida overgrowth and normalize flora in the intestinal tract. It is commonly used to reduce mucus trapped inside the body. Suggestion Directions: Take 1 capsule with a full glass of water twice a day with food; once at breakfast and once at dinner to achieve maximum effectiveness. You may increase to 2 capsules at a time if recommended by a holistic health professional or doctor. For therapeutic use.